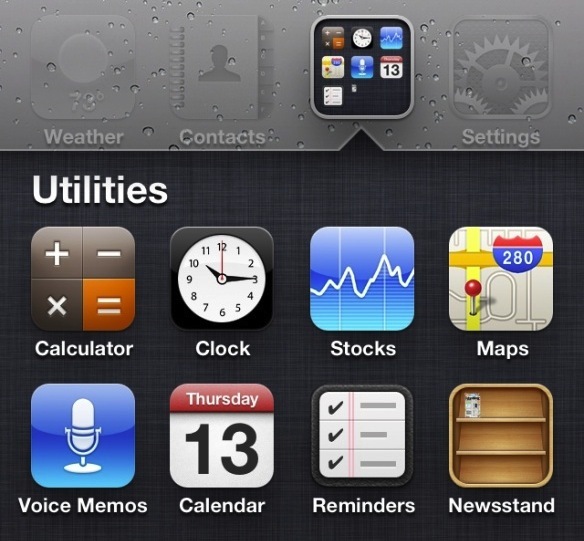 Those who have upgraded to iOS 5 have probably noticed that little Newsstand icon is unable to be moved to a folder, and like all other Apple iOS apps, it can’t be deleted. Well, a little tip from The Coding Massacre has made the rounds that shows us how we can force the Newsstand app into a folder under iOS 5, thanks to a bug in iOS. The downside is that if you then try to access Newsstand, springboard will usually crash. Due to the buggy nature of this tip, if you have any plans on using Newsstand to read magazines or newspapers on your iPhone or iPad, this is not recommended. Also, you have to be quick. Assuming you were quick enough, Newsstand will now be in that folder. As previously mentioned, this can often cause unstable behavior when accessing that folder and Newsstand, so don’t be surprised if Springboard (the iOS dashboard) starts crashing afterwards. It’s a fairly safe bet that iOS 5.1 will fix this bug and allow Newsstand to be moved around without resorting to such tricks. Total pain but at least it works. Apparently the Newsstand icon is actually a modified Folder in itself. As such, it cannot be dragged into another successfully and remain stable. I would love to be able to hide it, just like the Stocks App, etc. Or at best, shove it in a folder (just like the Stocks App) but since you can’t nest folders I’ve read that it is unlikely iOS5.1 will allow you to…. …of course, I wish to proven wrong. Worked for me – but if it starts getting wonky on me, I’ll just move it to the last page… I have a last page that just holds “lights”, in case I need one. When you attempt to sync after moving this, iTunes inevitably crashes, so I can’t see this as being a permanent solution. As mentioned, pretty sure they will address this flaw in the next update. Those that don’t want to see it will just have to move it to the last screen. Sweet! Worked on the 2nd try. I already have others in the office doing this. Thanks for the tip! this worked like a charm on the first try…. I haven’t synced since I did it, but I hope it doesn’t crash. very annoying, i put it on the last page..where apps are least used. I will never use this app and it cannot put in the Folder without problem. What Apple ideas about make it out of Folder?????? I really hate it. Cannot get it to work on 5.1; though few have mentioned they could. When I first begin a folder and grab the newsstand, the newsstand refuses to “grow”, indicating that it’s ready to be moved. I’m pretty quick with these things. I’ve tried it with 2 native apps, two foreign apps, and a native/foreign app. I even used the same apps I saw on the video; first, Video app over Reminders app, and then vice versa. Does not work with 6.0!! !